Also available: HTML, Chime Enhanced and JMol versions. Like the pine - I am lonesome for." 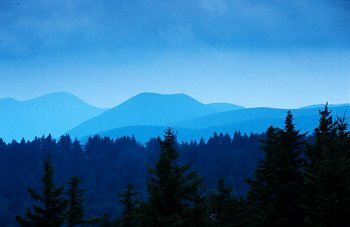 And you are going to tell me why the Blue Ridge Mountains are blue? Indeed. It's all down to isoprene and terpenes. Terpenes are naturally occurring compounds, derived from the 5-carbon alkene isoprene. They contain multiples of 5 carbon atoms - 10, 15, 20 and so on. Strictly, terpenes are hydrocarbons, but the word is also nowadays used to describe derivatives. Why do plants make terpenes? 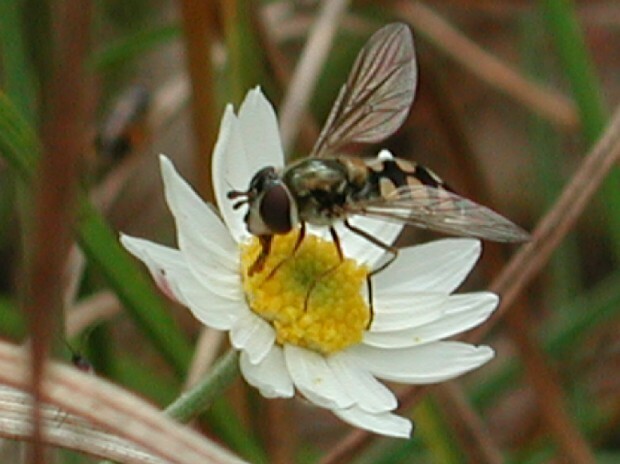 To attract insects to pollinate them. And, of course, to repel predators. Sometimes they are even more cunning, as there are some plants which, when fed on by an insect, release a molecule that attracts something that is a predator on the herbivore. It comes down to natural air pollution - trees exhale organic molecules like pinene and other small terpenes, but especially isoprene. Isoprene is closely involved in production of the air pollutant, ozone. In addition, when it is oxidised by atmospheric ozone, ·OH, or NOx radicals, it forms aerosols that cause scattering of the sunlight; since the intensity of the scattering is proportional to 1/λ4, the short wavelengths are enhanced in the scattered light, making it look blue (Rayleigh scattering). 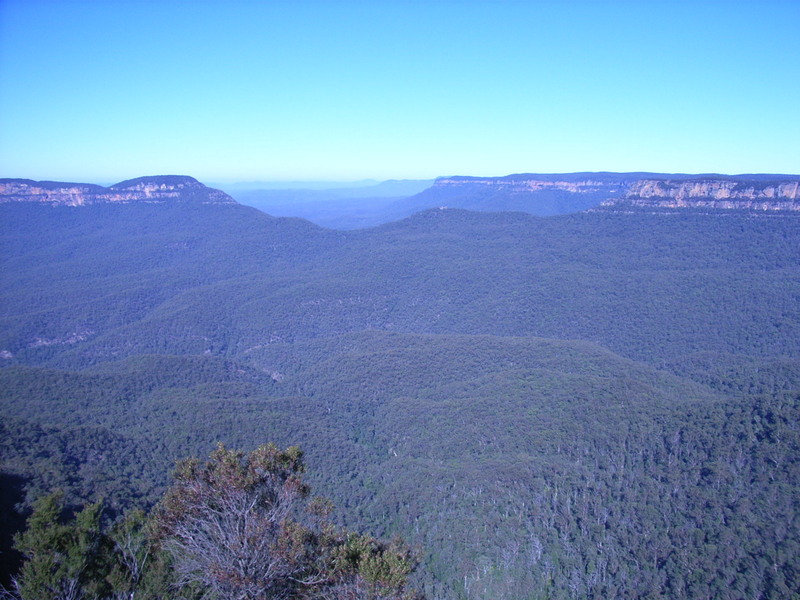 The Blue Mountains north of Sydney, Australia (photo, below left) are another example. In this case, the main molecule responsible for the blue colour is eucalyptus oil (below, right), another isoprene-derived terpene. And it is the terpenes that give the trees their odour? Indeed, molecules like pinene are responsible for "pine" smells, too. But there is more to pinene than that. It's got the molecular formula C10H16, so that, as you might expect, it's rather flammable. 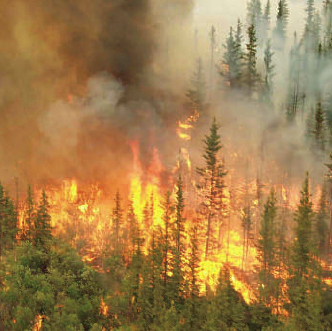 That's why pine cones and Christmas trees burn well, given the chance; it is also why forest fires involving conifers can spread fast. But there are lots of other terpenes? Limonene, menthol, geraniol, camphor, selinene, carophyllene, zingiberine, retinol and β-carotene are just a small sample of the thousands of terpenes that occur in nature. Limonene gives lemons their smell. A geranium - its smell comes from geraniol. Carrots - full of β-carotene. How do these terpenes get made, they look complicated to me? In their structures, isoprene units are joined together head-to-tail. That is, C1 of the four-carbon chain of one isoprene unit is joined to C4 of another. See, for example, the structure of β-selenine, below, which is made up of 3 isoprene units. However, isoprene itself is not involved in the biological synthesis. This is done starting with acetic acid; three of these molecules get used in forming mevalonic acid, which is converted into isopentenyl pyrophosphate. This can isomerise into dimethylallyl pyrophosphate. Two of these then react together to form geranyl pyrophosphate, which is the precusor of all monoterpenes. This can react further with another molecule of isopentenyl pyrophosphate forming farnesyl pyrophosphate, which is the precursor of sesquiterpenes. Two farnesyl pyrophosphate molecules can couple to give squalene, the C30 precursor of triterpenes, and also of steroids. I think I've got it now, when isoprene molecules join to each other, they form terpenes. Another important way in which isoprene units are joined together is in the formation of rubber. Yes, natural latex, produced by rubber trees (e.g. Hevea brasiliensis) as a defence against wounding by insect predators, is a suspension of latex, designed to gum up the mouths of the predators. Rubber got its name from Joseph Priestley (the man who discovered oxygen) who noted, on April 15th 1770, "I have seen a substance excellently adapted to the purpose of wiping from paper the mark of black lead pencil" and called it 'rubber' because it rubbed out the pencil marks. 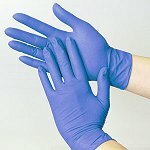 It consists of cis-1,4-polyisoprene molecules. This confers stretchiness on it (improved in the commercial material by cross-linking the chains with sulphur, in the process called vulcanisation). Gutta-percha, obtained in latex from other trees (such as Palaquium gutta, and other East Asian evergreens), is the trans-isomer, and not elastic. (Gutta-percha is often used as an insulating material for cables, not to mention golf-ball coverings). Chicle, used to make chewing gum, is a polymer with both cis- and trans- linkages. Kirk-Othmer Encyclopedia of Chemical Technology, Wiley-Interscience, 4th edition, Volume 14, 934 ff. Ullmann's Encyclopedia of Industrial Chemistry, Wiley-VCH, 5th edition, Volume 18, 629 ff. G. Rayner-Canham, D. Garnier, and R. Stirling, Educ. Chem., 2004, 41, 101. Eberhard Breitmaier, Terpenes: Flavors, Fragrances, Pharmaca, Pheromones, Wiley-VCH, Weinheim, 2006. C. S. Sell, A Fragrant Introduction to Terpenoid Chemistry, Royal Society of Chemistry, Cambridge, 2003. R. A. Rasmussen and F. W. Went, Proc. Natl. Acad. Sci. USA., (1965) 53 215. M. Lerdau, A. Guenther, and R. Monson, Bioscience, (1997), 47, 373. M. Claeys, B. Graham, G. Vas, W. Wang, R. Vermeylen, V. Pashynska, J. Cafmeyer, P. Guyon, M. O. Andreae, P. Artaxo and Willy Maenhaut, Science, (2004) 303, 1173. A. Guenther, T. Karl, P. Harley, C. Wiedinmyer, P. I. Palmer, and C. Geron, Atmos. Chem. Phys., (2006), 6, 3181. U. Kuhn, M. O. Andreae, C. Ammann, A. C. Araújo, E. Brancaleoni, P. Ciccioli, T. Dindorf, M. Frattoni, L. V. Gatti, L. Ganzeveld, B. Kruijt, J. Lelieveld, J. Lloyd, F. X. Meixner, A. D. Nobre, U. Pöschl, C. Spirig, P. Stefani, A. Thielmann, R. Valentini, and J. Kesselmeier, Atmos. Chem. Phys., (2007) 7, 2855. R.J. Yokelson, T. Karl, P. Artaxo, D. R. Blake, T.J. Christian, D.W.T. Griffith, A. Guenther, and W. M. Hao, Atmos. Chem. Phys., (2007) 7, 5175. J. Lelieveld, T.M. Butler, J.N. Crowley, T.J. Dillon, H. Fischer, L. Ganzeveld, H. Harder, M. G. Lawrence, M. Martinez, D. Taraborrelli & J. Williams, Nature, (2008) 452, 737. Back to Molecule of the Month page.